Thanks to our trusty online local historian Andy Grant, we know that Antonio Francisco Pirolli set up as a confectioner at 12, Oxford Street around 1930. Pirolli specialised in making and selling ice creams and the shop later was named Pip’s Ices. Having expanded the shop into number 13, it was still trading over forty years later. Pirolli died in 1982, aged 76. We do not know when the shop closed – that is where you come in. 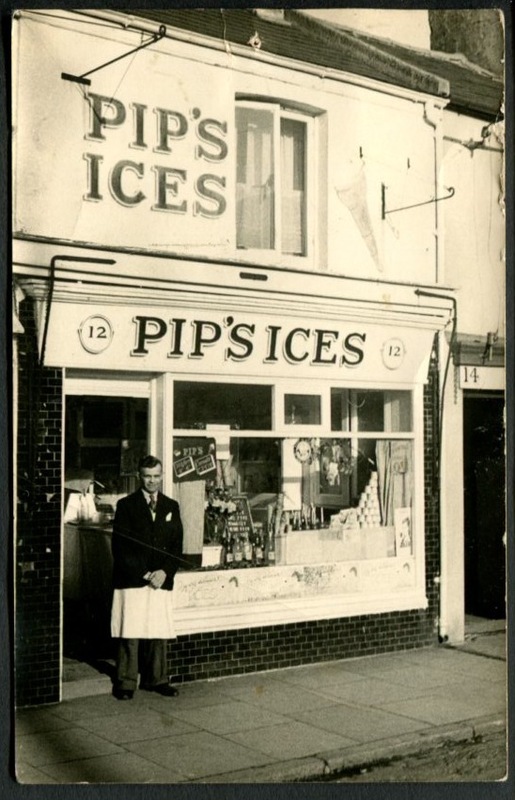 Do you remember Pip’s Ices? Do you remember Antonio Pirolli? What did you buy in the shop? Do you know when it closed down? Please share your memories with us by posting a comment below. I do remember ‘Pip’s Ices’, as a young lad I used to play football on the Level, this was about 1967 when I was 10 up to 1972. We used to have those 15 a side sort of games with ‘jumpers for goalposts’, the score used to be a usual ridiculous 15-12 but we had great fun. Then very occasionally we would go over to ‘Pip’s Ices’ for refreshment. I would always go for Ice cream soda with a dollop of vanilla ice cream at the bottom, I can’t remember how much I paid for it but it was delicious. From memory he was a very nice man and very friendly to his customers. Mr and Mrs Pip (always dressed in black), what a great memory. This ice cream was the best around the area. This shop was used by me and my school pals of a lunchtime and sometimes on the way home. Lunchtime we would spend our dinner money here and go and sit in the Level. Mr and Mrs Pip were always very friendly to everyone and had a smile for the kids. I later introduced my two daughters to their wonderful ice cream which they remember fondly. After Mr Pip died I often used to see Mrs Pip feeding the birds in the Level and she still had a cheery “hello ducky” in her broken English. I am not sure when Mrs Pip died but it must have been around the time when they redeveloped Oxford Street. A great street which lost all of its character. As the shop is on the even numbered side of the road (12-14), does this mean the shop was expanded to the other side of the road? Just curious. I remember it well. I always stopped for a cornet on the way back from The Level en route for Springfield Road. The elderly Italian couple were always very friendly – a bit of a Brighton institution. Hi Stefan. Oxford Street was numbered starting at London Road up to Ditchling Road, then returning back down the other side (as nearly all of the original streets in Brighton were). Pip’s took over the next door premises of Parsons Bennett, another confectioner and tobacconist at number 13, either during or just after after WW2. The shop was then #12/13, which is why the picture shows #12 and then #14 (dating the picture to post-war). Thanks for that, Andy! Unlucky 13 would have given me the pip too! My husband has very fond memories of the toffee apples! Oh how lovely to have the memories of Pip’s Ices. I often went there and had a vanilla Ice and also I loved the paper cones filled with rainbow coloured crispy rice/corn. Mr and Mrs Pirolli were parishioners of St Joesph’s Church in Elm Grove. Used to see them at Mass regularly. A lovely couple. Mrs Pirolli must have been heartbroken when her husband died. Not sure if they had any children. Mr. and Mrs. Pirolli had at least one son- Joe. He attended St. Joseph’s school and served at St. Joseph’s church. Joe himself has a daughter. Joe worked at Allen West, APV, Dentsply and finally Sunblest bakery. His wife died some years ago. Joe is now in a nursing home. My wife and I attend the church and know Joe quite well. I remember Pip’s Ice Cream – the best ice cream ever! Pink and White with ice crystals in it. I lived in Rugby Road and always went to Pip’s with my mother and brother and sister to get our ice cream treat. I actually went to school with Mr and Mrs Pirolli’s grandaughter, Maria, who was my travelling to school companion. Happy memories. My Mum had the baby linen shop opposite Pips, and Mr and Mrs Pip (as we called them) were always giving me and my brother and sister ice creams, they never charged my Mum for them. They were so kind to us especially after they found out that our Dad had died in the war. Oxford Street is not the same without Pips Ice Cream shop. Great memories. Yes I remember Pips and the lovely strawberry and vanilla ice cream wafers. I used to go there on the way home from school and on a Wednesday night – my mum used to take me to St. Joseph’s hall in Milton Rd for bingo and Mr & Mrs “Pip” used to run the raffle and give us kids a toffee apple for pulling out a raffle ticket during the interval. Happy days, so sad it has all changed now. Sadly, Joe Pirolli passed away earlier this month (Jan. 2015). He will be missed by all who knew him. I am related to the Pirolli’s – my Grandfather was Antonio’s brother. I am researching my family tree and know there are many relations in Brighton as this is where the family is originally from. Unfortunatelly, my Grandfather didn’t keep close contact during his lifetime. I do have some old photos however, and one with Pips Ices as a motorbike van which I could share. I’d love a copy of this shop and any others that people may have for my collection. Also if anybody knows members of the family I’d love to get in touch! Thanks in advance for any help. I remember the delicious pink and white ice cream well from Pips, as many people have commented – some of the best ice cream I have ever tasted. I can’t remember what the bakers was called, but I seem to remember it was very near Pips. I used to go to Margaret Hardy School near St Peter’s Church and a couple of friends and I would buy 6 pennyworth of stale cakes from the afore mentioned bakers. I have no idea how old these cakes were but some of them tasted pretty rank. Despite this, being kids, we still enjoyed them on our walk home to Hollingdean. Can you imagine children being able to buy stale cakes now? They didn’t do me any harm or my friends – I’m still around to tell the tale! As many have said before me; Happy Days. Pips Ices was owned and run by my Mum, Nina Pirolli (Nina Paolella), and Uncle Tony and Aunt Peppina. The Pirolli family moved to the UK around about the beginning of the last century. There were 6 brothers (another one had died in Brighton at about 18 months old, his grave is at Downs Cemetry) and one sister, Maria Rosa, who was also my grandmother because she had adopted my dad, Frank, when he was 5 years old. Maria used to live in a house with a bookshop at the front in Coombe Terrace. Her husband, Domenico Paolella, was also an immigrant from a village called Valle Grande in the Abruzzi area of Italy. He also was an ice cream vendor and had a horse and cart to sell ice cream. He fought in the war with the Italian army. The Pirolli family came from Santa Elia Fiumerapido in the Abruzzi area. Maria Rosa and Antonio were born in Italy, the other boys Lorenzo, Joseph, Peter and 3 more were all born in Brighton. My great grandparents were tinkers as well as owning an ice cream shop half way up Southover Street. My Grandad Peter (also known as Pip) used to have a picture of his parents by the Palace Pier with an organ grinder and a dancing monkey! I believe my great grandparents returned to Italy before the war and never returned. Their children all stayed, married and died in the UK. Antonio and Pep had one son Joey who lived near the Dip in Hollingdean and I have just found out that he sadly died recently. The whole family continued to attend Mass at St Joseph’s in Elm Grove, in fact my parents were married there. I was christened there and 2 of my 3 children were also christened there. My 5 x great grandmother, her son, and his daughter lived at 13 Oxford Street in Brighton, so I’m guessing this photo shows where they lived? This info was taken way back from the 1851 census – would this shop be that old? That’s my Mum’s Uncle Tony in the picture. Nina Paolella who trained me at North Road? Pete Paolella whose dive I was so envious of?